Hair thinning is a significant concern for a number of Orlando, FL women and men, whether it's brought on by genetics, age, hormones, health conditions, or from years of overstyling. With current advances in research within the hair restoration industry, new procedures are being created to help fight the problem. Platelet-rich plasma (PRP) is an innovative, nonsurgical procedure for individuals that's showing remarkable effects in slowing, stopping, and reversing hair loss. PRP has shown promising results in individuals with alopecia areata or thinning eyebrows. Orlando, FL board-certified plastic surgeon Dr. Armando Soto is just one of a small number of hair restoration surgeons to supply this revolutionary treatment. By blending a strong solution of hair growth factors and bioactive proteins, Dr. Soto can help strengthen your hair, resulting in thicker, longer, healthy locks. "Bridget and Amanda made a super weird and uncomfortable procedure quite easy! I was really nervous, but their calming manner and conversation relaxed me. The Geneveve treatment was completely painless and there was no down time. My significant other thoroughly enjoys the results as well." "Professional, kind, and knowledgeable. Amy made me look like I was on vacation for a year. I feel and look younger without evidence." "Dr. Soto and his staff have made me feel extremely comfortable throughout my whole process. They have answered all the questions I have had and made my surgery smooth and painless." "Extremely friendly and professional staff. They all, from the front desk, nurses, to Dr. Soto, make me feel comfortable. I feel that Dr. Soto understood exactly what I wanted and delivered exactly those results. I am beyond pleased with my new body even though I am only 3 weeks from surgery. I am so glad I picked this office for my surgery!" Any individual suffering from balding is potentially an excellent candidate for PRP hair therapy while patients with early hair loss typically yield the most favorable results. PRP is best suited for those with androgenic alopecia, an inherited type of hair loss that usually presents on the top part of the head. For women, this may appear as a broadening part with regular hair density on the backside of the scalp. Those with parts of "poor quality” hair growth of the scalp with normally reacting hair follicles have the greatest results with PRP hair regrowth therapy. As a nonsurgical procedure, the PRP treatment is a brief one-hour in-office visit. The session starts by withdrawing a little bit of your blood and putting it in a specialized machine, which circulates the blood at high speed to remove the platelets from the remainder of the blood elements. After that, a local anesthetic will be used on your scalp and the platelet-rich plasma is introduced into parts of your head that are bald or thinning. Then, microneedling is performed on the scalp to cause micro-trauma and micro-channels to the epidermis, which triggers the PRP and enables it to seep deep into the skin. Our routine for nonsurgical management of baldness includes an initial therapy and maintenance therapies about every nine months to a year. 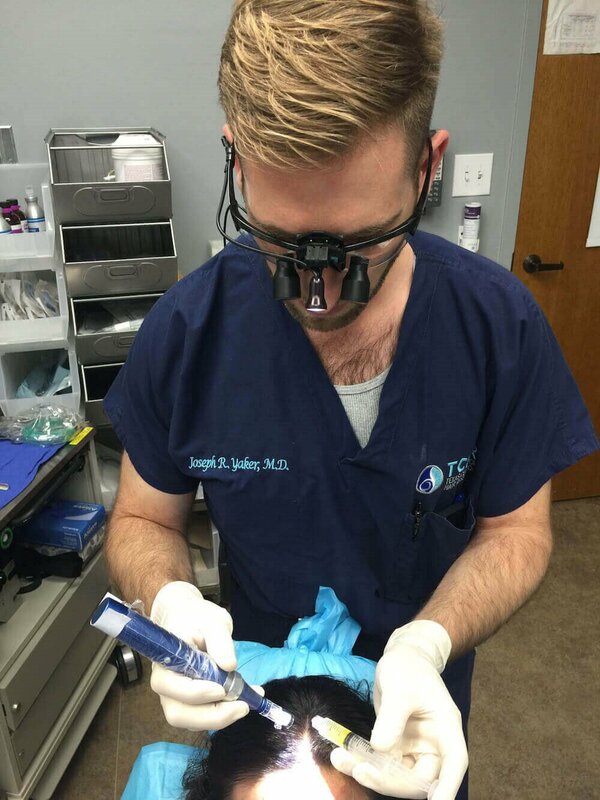 There's no downtime or recovery necessary after this procedure with very little limitations or constraints. If anything, patients can develop some discoloration, minor swelling, and mild discomfort to the treated regions. These symptoms might last up to two days. While outcomes differ for every individual, aesthetic results are generally noticed approximately 4 – 6 months after the initial session and may continue to improve for as much as a complete year following therapy. Since PRP isn't a permanent option for reversing hair loss, follow-up sessions are highly recommended every 12 – 18 months. It's very important to remember that PRP doesn't develop new hair follicles in places where you're already bald. It's utilized to reverse the miniaturization of hair follicles so they will create fuller, healthier, longer hair fibers. How effective is PRP at treating hair loss? The outcomes of your treatment will depend on the severity of your hair loss. Dr. Soto will need to understand how long you have been experiencing hair loss and how far it has progressed to understand if this treatment can help you. He will be able to determine how many treatments you will need to get and other factors as well. It is also important to remember to be patient with the results. Hair growth takes time and once PRP assists in stimulating the process, it is important to have realistic expectations. You may need to continue to get PRP therapy to maintain your results and limit future hair loss. How often should I get PRP hair treatments? Most patients will undergo a series of three PRP hair treatments spaced about a month apart. How many you will need after this initial treatment schedule will depend on the progression of hair loss you are experiencing. Dr. Soto generally creates a custom plan for his patients, which outlines how often you should have treatment. If your hair loss is more advanced, depending on what your ultimate goals are, he can consult with you about different treatments. Can PRP be combined with other hair treatments? PRP therapy for the hair can be combined with other hair-related treatments, such as topical medications for hair loss, as well as microneedling. It is a healthy serum that can be used for many purposes, even combined with more aggressive hair loss treatments. Dr. Soto will discuss his recommendations for what in-office treatments he believes will work best to treat your hair loss and will also include and discuss any at-home products that might help between appointments. Are PRP injections to the scalp painful? During your appointment and while the serum is being prepared, we will apply a numbing ointment to your scalp to keep you comfortable during the injection process. This helps to minimize your discomfort during the procedure. Your scalp may remain sensitive, a little swollen, numb, or "tingle" for a little while after your PRP injections, but this is temporary. PRP treatment is a clinically backed choice for people struggling to decide between hair loss solutions. At Armando Soto, MD FACS, we are proud to offer innovative solutions to efficiently address hair loss. To hear more about PRP therapy for the hair, we invite you to call the Orlando, FL plastic surgery center of Dr. Armando Soto.